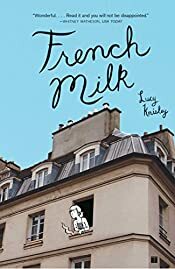 I moved on from reading Eye of the Crow to something completely different: French Milk, by Lucy Knisley is a memoir, written in graphic novel format, of a month-long holiday the author took with her mother in Paris, France. I came across this novel when I was reading around the blogosphere (when I do this kind of surfing around, it’s extremely dangerous for my TBR list, which grows at an astronomical rate); I immediately put in a hold request for it from the library (I’m not sure whether my librarians actually like me all that much anymore, because I’m always putting things on hold). This was a lovely, quick read; what I liked most about it were all the descriptions of the food that Knisley and her mother ate, accompanied by Knisley’s charming illustrations. Interspersed throughout are black and white photographs from the trip; the photos are a nice accompaniment to Knisley’s drawings. The preface to the book talks about the self-discoveries Knisley made during the trip, as well as similar revelations about her relationship with her mother, but I didn’t feel this to be the book’s strong point; it’s not so much about the author’s fully coming into adulthood while in Paris, as it is about all the wonderful sights and experiences she had while there. Her mother accompanied her, true, but I didn’t get much insight into their relationship. If anything, I got more of a feel for the author’s relationship with her father, who joined them for a few days of the trip. French Milk is at its heart a wonderful and charming travel memoir – a fun, quick read that will leave you dreaming of leaving regular life behind for a few lovely weeks in Paris. This entry was posted in Books and Reading, Reviews and tagged graphic novels, holidays, Lucy Knisley, memoirs, nonfiction, travel memoirs on December 14, 2009 by Belle Wong. This one has been on my wish list for a long time! Glad to see you liked it. Hope you enjoy it too when you get to it. It’s really such a fun, quick read. This book seems to get very different reviews, but being a Paris fan myself, I think I’d love it! Glad you enjoyed it, too. I just read my first graphic novel this weekend! .-= Aarti´s last blog ..Review: Fun Home =-. I’ve just started really reading graphic novels recently, too. They are just such fun! I think you really have to dive into French Milk as a travel memoir, and not as anything really insightful or a coming of age story. As a travel memoir, it’s very charming. I have this on hold at the library too. After your review, I really am looking forward to getting my hands on it. This is going to be my first graphic novel. .-= Margot´s last blog ..Book Review: A Cousin’s Prayer =-. I hope you enjoy it, Margot! It’s a quick and easy read. One thing I forgot to mention in my review – her voice really comes through. I could actually see my daughter come up with something like this (only she would use film, of course!). I can’t wait to read this one. Sadly, my library doesn’t have it. I was surprised my library had it. They don’t have a huge graphic novel collection. Hope you get a hold of it soon, Amanda! Maybe I’ll put it on hold at the library too, and we’ll start sort a worldwide movement, and nobody will know how it got triggered! I did try to get Eye of the Crow but, like other books in my library’s catalog, it is Missing in Action! It now moves, like so many other books, onto my Amazon wish list! I’ve noticed that some bloggers actually have libraries that let you request that they buy a book that they don’t have – unfortunately, mine doesn’t seem to do that, or at least, I haven’t been able to find a sign that they take those kinds of requests anywhere. I do hope you get a chance to read Eye of the Crow, though, Jill. I was most impressed with it. I enjoyed this book, too! It made me want to visit Paris again. My TBR pile has grown so much bigger over the last few months. There are sooooo many good books out there. .-= Jemi Fraser´s last blog ..Elusive Endings =-. I LOVED this book! It was such an easy read — yet so personal and profound. I think I need to re-read again sometime soon. .-= molly´s last blog ..2010 Support Your Local Library Challenge =-. I loved this one, too…but you’re right, it makes you want to pack up and take a trip! .-= softdrink´s last blog ..Humbug =-. This sounds awesome — and just the kind of thing that I like! Books where the authors travel and have an amazing time are my favorite. Europe is definitely life-changing. I’ll look for this one! .-= Meg´s last blog ..Why I’m a hopeless romantic, vol. 1: Craigslist’s ‘Missed Connections’ =-. I absolutely wanted to rush right over the ocean — with my mom! — when I finished the book. I really loved it. I heard somewhere that french milk is actually pretty gross. One of these blogs… which I could remember which one! .-= Ladytink_534´s last blog ..Have a Furry Christmas! =-. Pingback: TSS: Introduction to the World of Graphic Novels « A Book Blog. Period.